There’s a major problem brewing worldwide with NSAID pain management relievers. They are the most commonly used medications worldwide, and 15% of those taking it are exceeding safe levels. Fortunately there is a new wave of alternative pain management coming into view. CBD is widely available and studies show it can be more effective than NSAIDs with fewer side effects. This common group of over-the-counter or prescription medications is often seen as harmless, and in fact can be when used according to package directions and sparingly. Unfortunately with prolonged used there is a higher risk of things like heart failure, heart attack, stroke, gastrointestinal bleeding, acute renal failure, ulcers, and more. CBD To The Pain Management Rescue? It turns out that CBD can treat many of the problems that people commonly use NSAIDs for, and a whole lot more. CBD helps your neurological system uptake neurotransmitters that are responsible for things like inflammation and pain, and similar chemicals are already present in your body. In fact, research shows that an absence of these chemicals naturally can contribute to certain common ailments like migraines, irritable bowel syndrome, and fibromyalgia. This has implications for many serious issues. CBD could be used to treat addiction and prevent relapses. CBD has shown promise in treating cancer pain management, joint pain, migraines, and many other inflammatory disorders. Of adults who have tried CBD, 57% plan to keep using it to supplement their medications, while 42% are planning on making the switch to CBD instead of their medications. The future of pain management may shift away from opioids and toward CBD, a much more effective treatment with none of the serious side effects. Currently the majority of CBD on the market is made from hemp, making CBD widely available even in states where cannabis is not yet legal. With little to fear from side effects, there’s no reason to stay in pain. 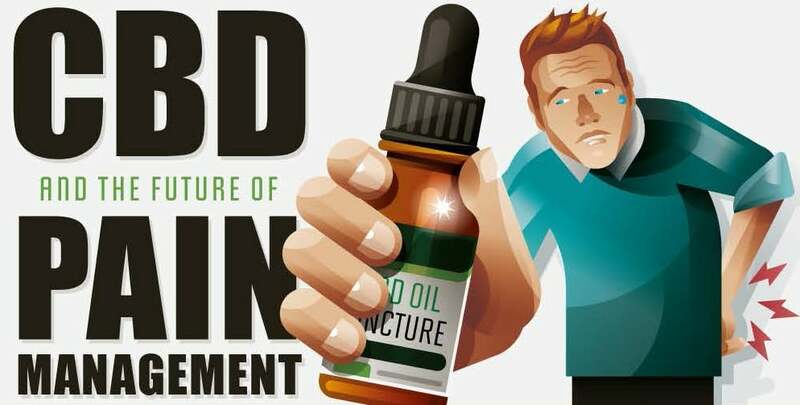 Learn more about CBD and the future of pain management from this infographic.